I just got home from the picturesque Barber Motorsports Park, where the Battery Tender Global MX-5 Cup Series had rounds three and four. There was a lot of on-track action, not just with MX-5 but also with IndyCar and a couple of debut events for IMSA, including GT3 Cup and Super Trofeo. Fans definitely got an action-packed weekend of racing! The MX-5 Series had a condensed schedule, with two practice sessions on Friday followed by qualifying and both races on Saturday. As you might expect, Race 1 was a bit tame because drivers wanted to ensure they had a good race car for Race 2. Race 1 was green the entire time, which speaks volumes about the level of driving, with 30 drivers navigating a tight, twisty track in close-quarters racing. Some of the drivers I was helping this weekend had a good start in that first race and were poised for a successful jump into Race 2. Race 2 had a bit more drama with an incident on the first lap, but from there forward it was green-flag racing, with lots of exciting passes for the lead. Eventually, Bryan Ortiz took his first win of the season, which promotes him into the points lead as the series goes into its long “Spring Break.” The series won’t be on track again until Road America in June. 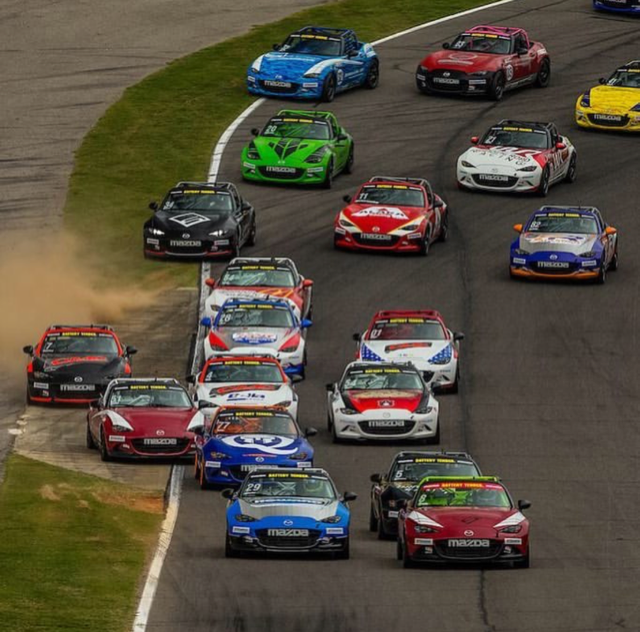 After a busy start to the Global MX-5 Cup season—four races in three weeks—there’s now a large two-month break before the next set of races. From a driver’s perspective, it will be important to stay sharp by not only practicing for the upcoming Road America round (practicing on the simulator or reviewing video from the previous year), but also by staying active in the driver’s seat. Any kind of quality on-track activity these drivers can get will play an important role in continuing their development through this long stretch. It can also serve as a good opportunity for teams to go test at other tracks on the schedule, which pays dividends as the season unfolds. Later this week I’ll be at Virginia International Raceway for the SCCA Majors Super Tour. If you’re planning to attend the event, come find me at the Mazda support trailer, where I’ll be providing complimentary coaching for all Mazda drivers. You can sign up on site at the trailer.